Our Plastic-Hungry Beetle Hits The Durban Beach! It was with great pleasure that we hosted the first Dung Beetle Beach Cleanup at the mouth of the Umgeni River north of Durban. We would like to thank our partners Zig Zag Magazine, Durban’s Green Hub, Durban Green Corridor , Durban Maker Space, and Durban Solid Waste-DSW , and the City of Durban. It was a huge success thanks to these organizations and everyone who pitched up. Durban band Nipho Hurd plays a set on the beetle stage after the beach cleanup. The event brought families and people together from all walks of life to clean up the Blue Lagoon beachfront at the mouth of the Mgeni River. The bags of rubbish in the foreground contain plastic from the beach cleanup with Zig Zag Magazine. 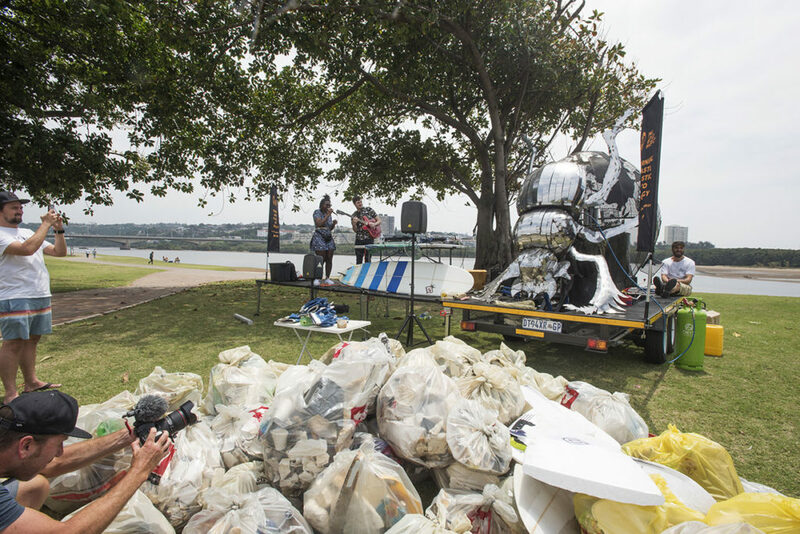 The Umgeni river is one of the biggest sources for ocean plastic in the south west Indian Ocean. It was great that teams of people were able to remove about a ton of plastic from the beaches and mangroves of the river mouth. We shredded it with help from Durban Maker Space using an open-source shredder design from Precious Plastics in Holland. We also built one of these shredders and although small, it is mighty. Thanks Durban Maker Space for the help! 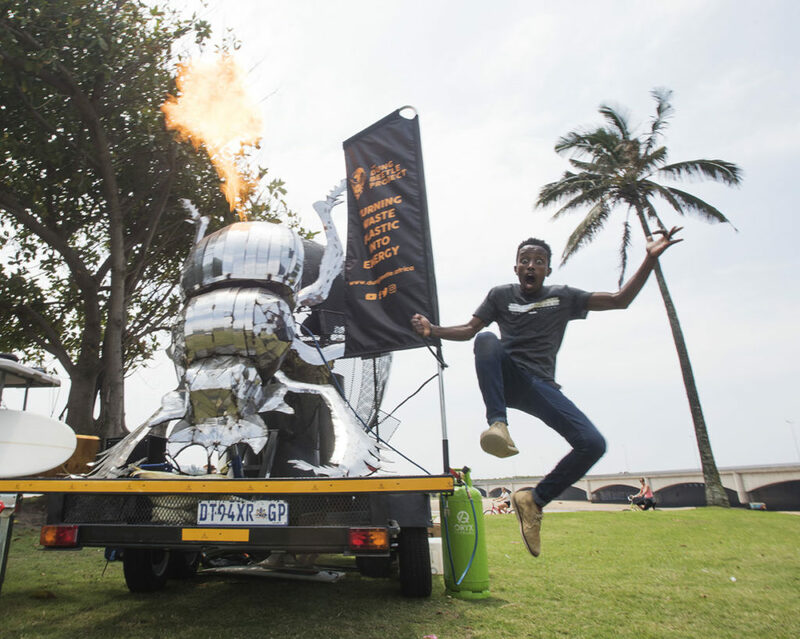 Sifiso Mngoma from the Green Hub launches into the air firing off the flare from the beetle. We had a great talk that included Durban’s Municipal Manager Gary Cullen, as well as scientists from the University Of KwaZulu Natal. Thanks to everyone for being part of such a great event that saw hundreds of people participating. Thanks especially for the hard work of Andy Davis from ZigZag Surf Magazine and Sifiso Mngoma from the Green Hub ! 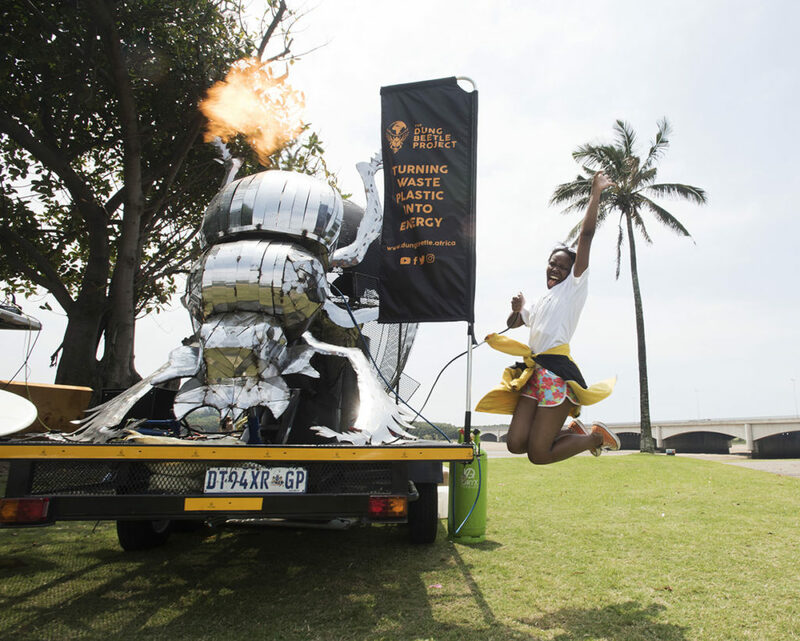 The Dung Beetle Project communications officer Tanele Dlamini jumps for the camera on the lawns of the green hub in Durban in front of the beetle. 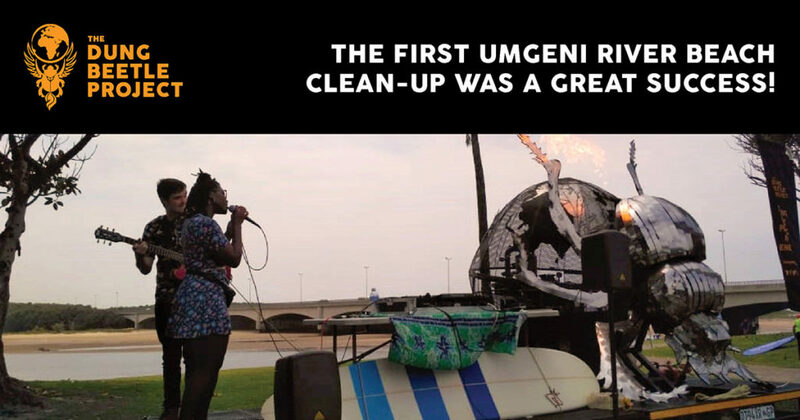 This entry was posted in Blog and tagged City of Durban, Durban Green Hub, Durban Solid Waste, Green Corridor, KZN-Natal beach clean up, The Maker Space, Umgeni River, ZigZag Magazine. 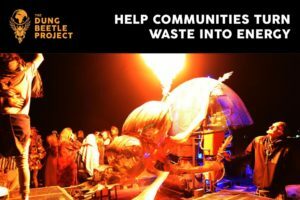 Join The Dung Beetle Project in a beach cleanup event at the Umgeni River mouth and see first-hand how this machine turns plastic to fuel. In just a year the Dung Beetle Project has gone from a dream to a shining reality. Your WTP (What The Plastic!?) guide to recycling! Comments Off on Your WTP (What The Plastic!?) guide to recycling! Young Victor finds out how exactly the Dung Beetle works. Comments Off on Young Victor finds out how exactly the Dung Beetle works.